The Baptistery, seen from Giotto’s campanile. An old legend claims that Florence’s beautiful Baptistery of San Giovanni was originally a temple of Mars, the Roman god of war. The Roman emperor Augustus supposedly had it built to celebrate the subjugation of nearby Fiesole (Faesulae in those days) and the early Christians later converted it into a Christian place of worship. Although this story is mostly rubbish, there is a grain of truth in it: archaeological evidence shows that the Baptistery was indeed built on top of Roman buildings from the first to third centuries, but there is not a shred of evidence that these had anything to do with Mars and the Baptistery is certainly not a Christian adaptation of a pagan temple. 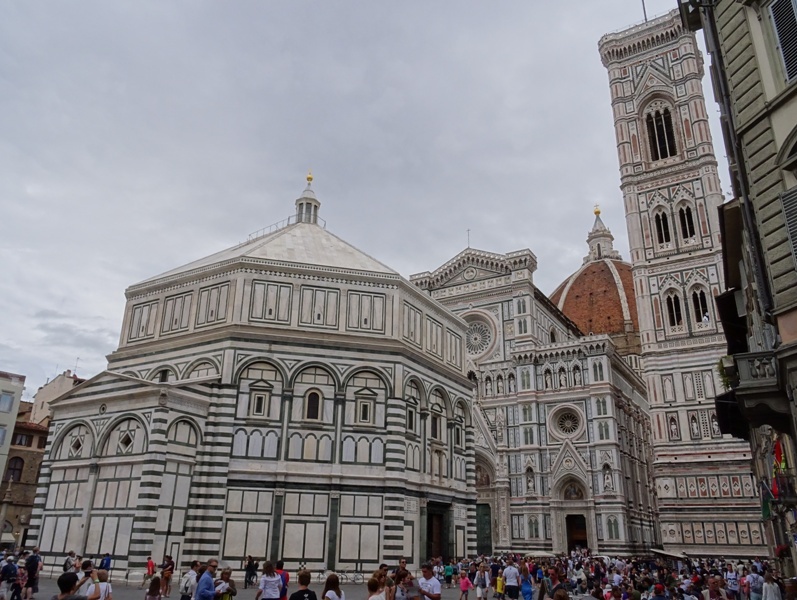 The Baptistery ranks among Florence’s oldest buildings, and there is a lot to tell about this spectacular edifice which is directly opposite that other important Florentine landmark: the Duomo. Even though you can visit both on the same combination ticket, these are clearly two distinct buildings. The Duomo was traditionally under the protection of the Arte della Lana (wool guild), while the Baptistery was administered by the rival Arte di Calimala (cloth and wool merchants guild). 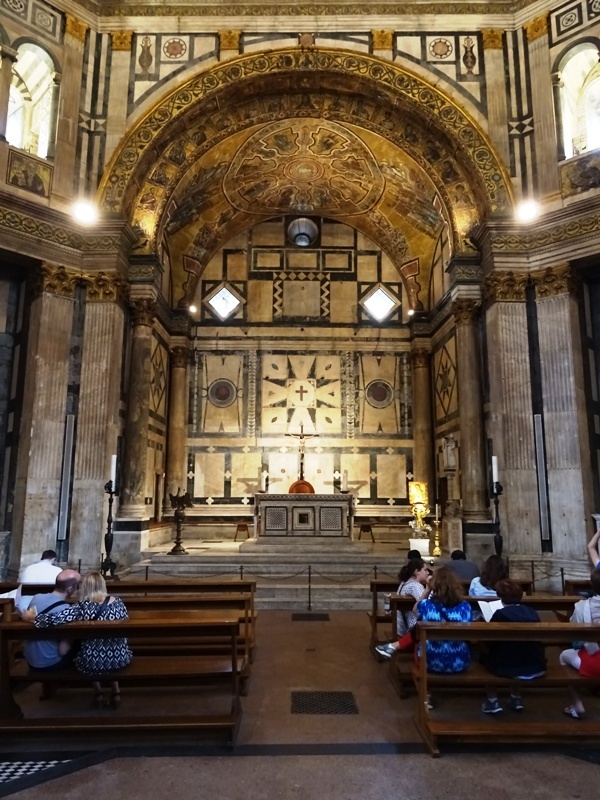 It is dedicated to Saint John the Baptist – San Giovanni in Italian – who is of course closely connected to the sacrament of baptism and also happens to be the patron saint of Florence. The Baptistery and the Duomo. To be honest, the early history of the Baptistery is shrouded in mystery. It may have been built as early as the late fourth or early fifth century. There is no direct evidence to prove this assumption, which is based solely on the Baptistery’s octagonal shape and the presence of Late Antique octagonal baptisteries in other Italian cities, for instance the Orthodox and Arian Baptisteries in Ravenna, which were built before 431 and after 500 respectively. We do know that it was Pope Nicholas II (1059-1061) who was responsible for the building that we see today. Born Gérard de Bourgogne, Nicholas had been Bishop of Florence until his election as Pope and apparently wanted to do something good for the city where he had spent some fifteen years of his life. The Pope had the baptistery restructured or perhaps rebuilt from scratch and consecrated the new building on 6 November 1059. 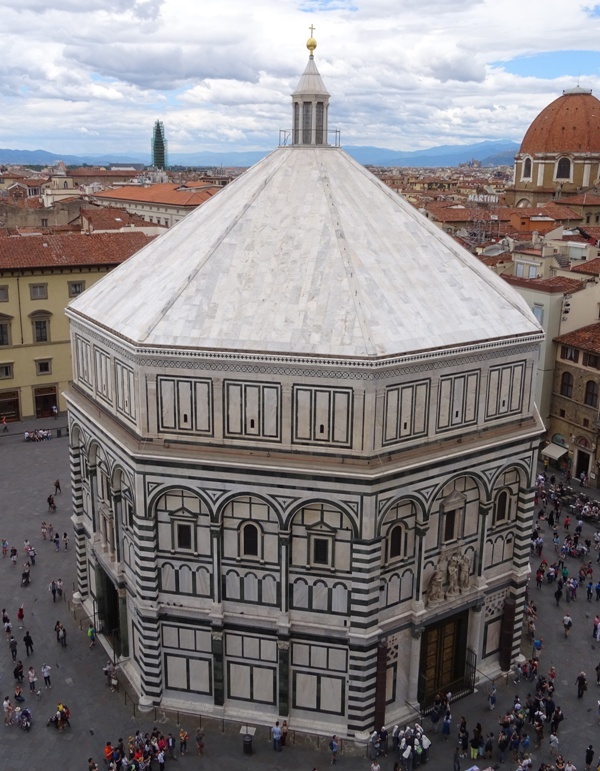 The exterior of the Baptistery was decorated with fine white and green marble, which made the structure look like it was entirely made of the precious stone. The decorative patterns closely resemble those of the San Miniato al Monte on the other side of the river Arno. The roof was also clad in marble panels, which is somewhat unusual and for instance not seen in the aforementioned baptisteries in Ravenna. The lantern topping the roof was presumably added in the second half of the twelfth century. It was heavily restored between 1898 and 1907. The 14th century baptismal font, sadly ignored by most tourists. 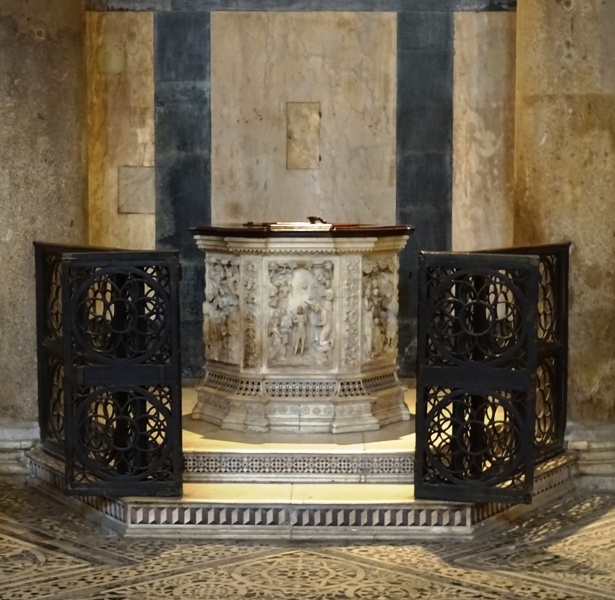 It was not until 1128 that the baptismal font was moved from the cathedral of Florence – Santa Reparata at that time – to the Baptistery of San Giovanni. This was a large octagonal baptismal font, intended for baptisms by full immersion. It was placed at the centre of the building and must have taken up a lot of space. The poet Dante Alighieri (ca. 1265-1321), who lovingly called the Baptistery “My San Giovanni”, once saved the life of a child who had fallen into the font, so it must have been fairly deep as well. Baptisms by full immersion were gradually phased out and replaced with baptisms by affusion. Use of the large octagonal font was discontinued and a new and much smaller baptismal font sculpted in 1370 was used instead. Grand Duke Francesco de’ Medici (1574-1587) had the old font taken apart in 1577. The contours of the font are still clearly visible on the floor. The scarsella with the present altar. In or around 1202, a rectangular apse was added to the Baptistery, perhaps replacing an earlier semi-circular one. This apse is known as the scarsella. The altar in the scarsella is not the original one, although it does consist of a number of original Romanesque parts. The original medieval altar (ca. 1200) was replaced with a new Baroque version in the eighteenth century, and the Baroque altar was in turn replaced with the current altar at the beginning of the twentieth century. This altar can be seen as a “credible imitation”, based on several old drawings and in part composed of marble parts that had been preserved. The apse occupies the western part of the building, which means that the three entrances face the north, east and south. Originally these entrances would have had wooden doors, but these were later replaced with gilt bronze doors made by Andrea Pisano (ca. 1290-1348) and Lorenzo Ghiberti (1378-1455) which have become deservedly famous. To protect them against air pollution (and tourists, I assume), the original doors have all been moved to the Museo dell’Opera del Duomo (just behind the Duomo). And even before they had been replaced by excellent copies, the doors had switched places more than once. The oldest set of doors was created by Andrea da Pontedera, known as Pisano and trained as a goldsmith, between 1330 and 1336. Pisano’s doors have 28 panels, 20 of which show scenes from the life of Saint John the Baptist. The remaining 8 depict the Virtues: Hope, Faith, Fortitude, Temperance, Charity, Humility, Justice and Prudence. 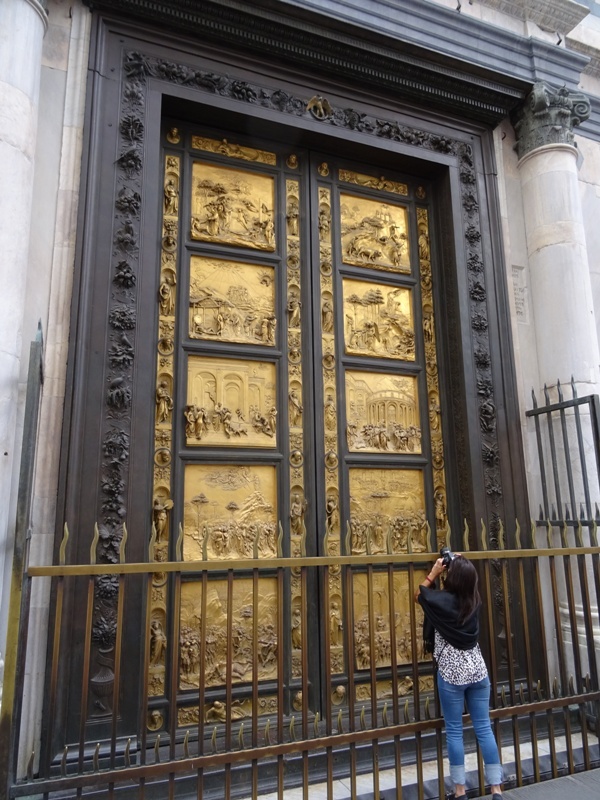 The doors may have been partly based on the bronze doors of the Duomo in Pisa – which were destroyed by a fire in 1595 – and Pisano certainly received help from metalworking experts from Venice. Pisano’s doors were originally installed in the eastern portal, which was the main entrance to the Baptistery, the one directly facing the altar. They were moved to the southern portal in 1424 when Lorenzo Ghiberti completed his first set of doors. Ghiberti’s first set of doors (Museo dell’Opera del Duomo). In 1401, a competition was held and the winner would be granted a commission to create a second set of bronze doors. The young Lorenzo Ghiberti, only in his early twenties and trained as a goldsmith, managed to defeat much more experienced and famous rivals such as Filippo Brunelleschi. The assignment was his. Ghiberti started the work in 1403 and finished it more than twenty years later, in 1424. The new doors were fitted into the eastern portal, definitely the place of honour, while Pisano’s doors were relegated to the much less prestigious southern entrance. 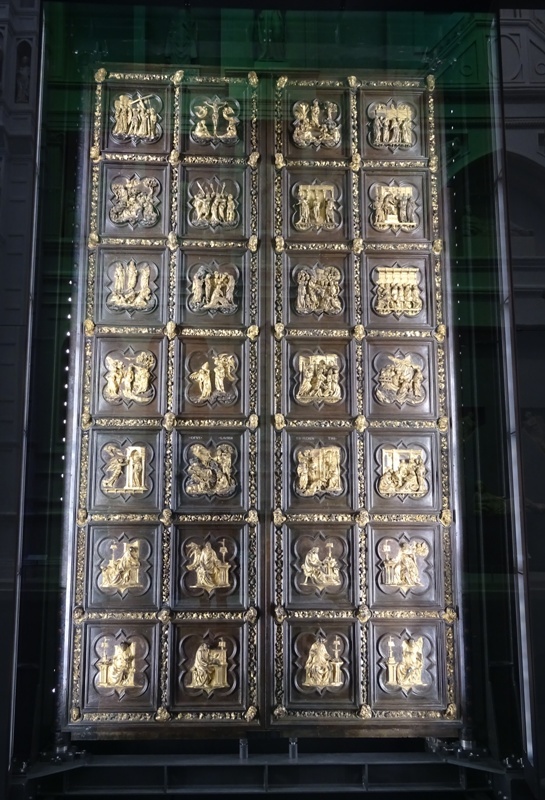 Ghiberti’s doors have 28 panels as well. 20 of them show scenes from the New Testament, while the remaining 8 depict the four Doctors of the Church and the four Evangelists. While creating the first set of doors, Ghiberti had been aided by his father, but also by artists such as Donatello, Michelozzo, Paolo Uccello and even Masolino, who were all somewhat younger than Ghiberti and like him still at the very start of their illustrious careers. The doors certainly made Ghiberti famous, and in 1425 he received a second commission from the Arte di Calimala, this time apparently without a competition. Ghiberti would work on his second set of doors until 1452, just three years before his death. The Gates of Paradise (the copy, hopefully she knows…). The second set of doors is arguably even more famous than the first set. Michelangelo supposedly called them ‘The Gates of Paradise’ (according to Vasari) and they have become known to posterity under that name. The Gates of Paradise have fewer panels with scenes than the other two doors. The ten panels all show scenes from the Old Testament, featuring important Biblical figures such as Adam and Eve, Cain and Abel, Noah, Abraham, Jacob and Esau, as well as Joseph, Moses, Joshua, David and Solomon. Because there are only ten panels, the scenes on them are much larger and much more detailed, and it has to be said that the level of detail and especially the use of perspective are simply incredible. The Gates of Paradise were immediately granted the place of honour and fitted into the eastern portal where they stayed for centuries until they were moved to the Duomo Museum in the 1990s. So to sum up, Pisano’s doors, although made for the eastern portal, ended up in the southern portal to make way for Ghiberti’s first set of doors, which were in turn removed to the northern portal to make way for the second set, also known as the Gates of Paradise. Here are a few pictures of scenes from both the original Gates of Paradise and the copy. It should be quite easy to spot the differences in colour, but the copy is arguably of very good quality. 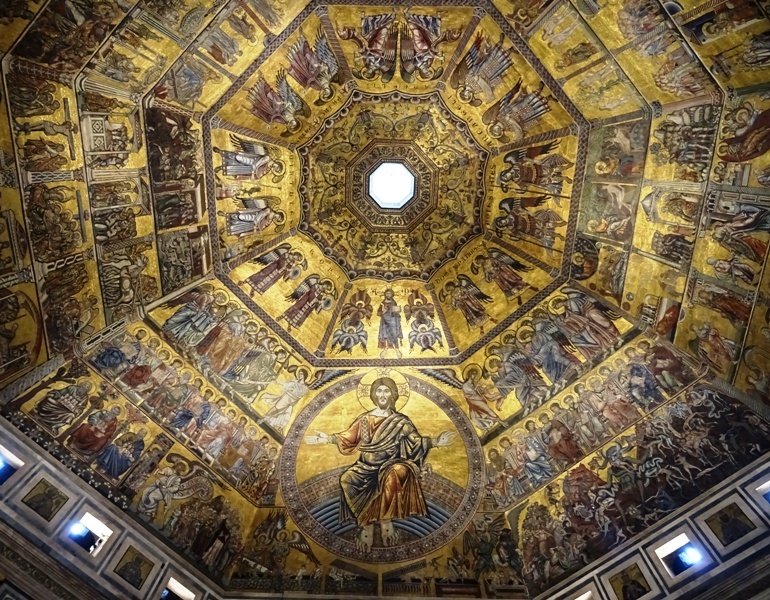 In his latest novel Inferno, author Dan Brown claims that when entering the Baptistery, it is impossible not to look up. For once, I agree with Mr. Brown. The shiny ceiling mosaics with their magnificent golden glow are truly the highlight of any visit to the building. The mosaics were financed by the Arte di Calimala and work on them probably started around the year 1225. It was finished some eighty years later. Dozens of artists were involved in the process of creating the mosaics, from sketching the preliminary cartoons to actually baking the tessarae, cutting them to size, applying the mortar and inserting the tesserae to create the images. It is impossible to identify all the artists behind each and every individual mosaic, but art historians usually assume that at least Coppo di Marcovaldo (ca. 1225-1276), Meliore di Jacopo (active ca. 1260-1280) and Cimabue (ca. 1240-1302) and their workshops and schools were involved in the process. Gaddo Gaddi (ca. 1239-1312), father of Taddeo Gaddi, may have participated too, and perhaps even the great Giotto himself. Other artists are not known by their true names and are simply called “Master of Mary Magdalene” for instance. Almost immediately after the mosaics were finished, there were problems with rainwater trickling in through the marble panels of the roof, which were not completely waterproof. As a consequence, tesserae from the mosaics started to come off and the artworks had to be repaired on several occasions. Various restoration programs were launched, and in the fifteenth century, Alessio Baldovinetti (1425-1499) was given a permanent commission to oversee the renovations. Baldovinetti was one of the last artists versed in the art of mosaic setting. After him, the skills required were soon no longer available. Problems with the rainwater persisted, and eventually large chunks of the mosaics were lost and replaced by pieces of painted plaster. It was not until 1898 that these were removed and replaced with genuine mosaics again. The experts of the Opificio delle Pietre Dure worked on the mosaics until 1907 and did a splendid job. The ceiling consists of eight segments, which are subdivided into several registers. The mosaics surrounding the lantern merely show decorative patterns, but the other mosaics are all about stories from the Bible, both from the Old and the New Testament. 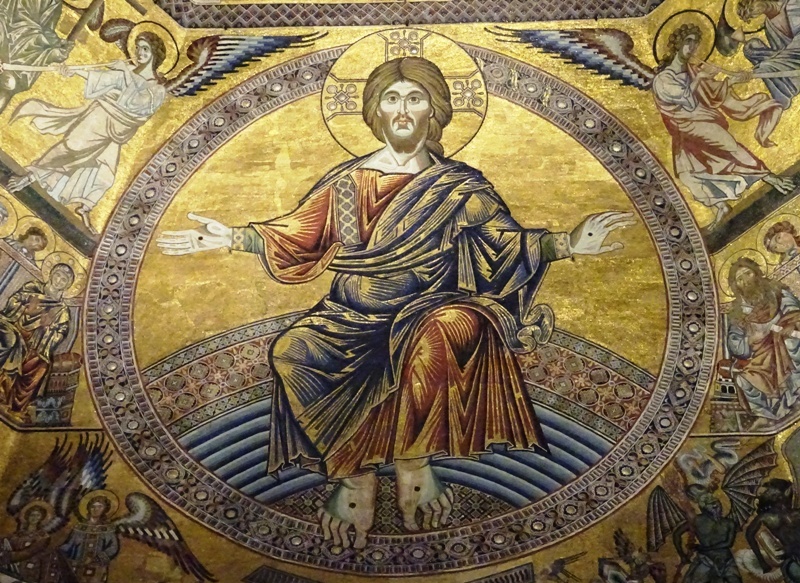 The most impressive mosaics are those related to The Last Judgment. These were made between 1260 and 1275. At the centre is a gigantic image of Christ the Judge, some nine metres high, attributed to either Coppo di Marcovaldo or Meliore di Jacopo (or their followers). Christ is flanked by three registers on each side. The top registers show processions of angels, blowing horns and carrying objects pertaining to the Crucifixion: nails, a hammer, the crown of thorns, the spear and the cross. The middle registers depict the Virgin Mary, Saint John the Baptist, the Apostles and several more angels. Finally, in the lower registers, we see the dead rising from their graves below Christ, the Elect in Paradise on the left and the Damned in Hell on the right, all by followers of Coppo and Meliore. In the scene with the Elect, we further see the patriarchs Abraham, Isaac and Jacob with some of the Elect on their laps, and an angel with a text from Matthew 25:34. The scenes about Hell are truly horrifying, with a giant Devil and several snakes devouring the bodies of the Damned. On the right, we can just see Judas the traitor hanging from a tree. In her excellent The Baptistery of San Giovanni in Florence (2000), Annamaria Giusti spends some forty pages to discuss all the other ceiling mosaics in great detail. I will not do that here. To sum up, the other mosaics deal with God the Creator and the several classes of angels, as well as with several important stories from the Bible. We can admire stories from Genesis and stories about Joseph, Jesus Christ and John the Baptist. Burial around the Baptistery was not uncommon until the late 1300s, but burial inside the building was a rare privilege. After Bishop Ranieri was interred here in 1113, the practice of burying people inside the Baptistery seems to have been discontinued altogether. It is perhaps a case of striking historical injustice that a person with a rather questionable reputation – to put it mildly – would become the last to be buried here after 1113. 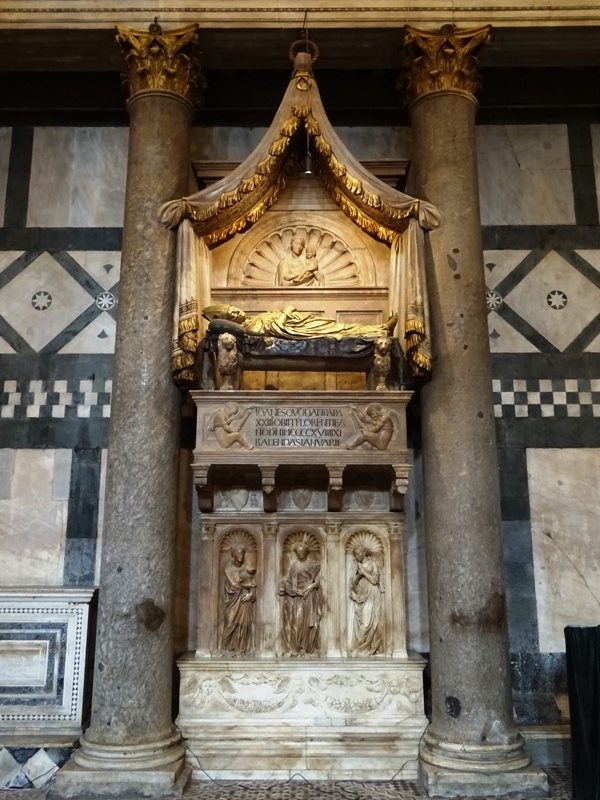 To add insult to injury, this person would receive what is arguably the most splendid tomb inside the Baptistery as his final resting place. It was created by the famous artists Donatello (1386-1466) and Michelozzo (1396-1472) and can be found on the wall to the right of the scarsella: the tomb of Antipope John XXIII. John XXIII was a product of the Great Western Schism (1378-1417), which saw one pope in Rome pitted against another pope in Avignon. In 1409, an Ecumenical Council tried to end the conflict, but the results were disappointing: Europe ended up with a third pope, ruling from Pisa. John XXIII (1410-1415) was the second pope from the Pisan line. He was born Baldassare Cossa on the island of Procida off the coast of Napoli. He seems to have had little interest in religious matters, and historian John Julius Norwich simply calls him a lifelong pirate. The Council of Constance deposed him in 1415 and elected Oddone Colonna as the legitimate pope in 1417. Colonna would take the name Martinus V. The now former pope John XXIII ultimately submitted to Martinus’ rule and retired to Florence, where he had close relations with the influential de’ Medici family. In fact, Cosimo the Elder was one of the executors of his will, which stipulated that he wanted to be buried inside the Baptistery. Since Cossa (who died in 1419) also left much of his wealth to the church in his will, his final wish was granted. Donatello and Michelozzo started work on the tomb in 1422 and completed it in 1427 or 1428. The monument had to be fitted in between two columns, so it has a vertical composition. At the bottom, we see the three Theological Virtues, Faith, Hope and Charity, virtues that seem to have been wholly foreign to the deceased. Cossa is mentioned as IOANNES QVONDAM PAPA XXIII, “the former pope John XXIII”, on the tomb. Pope Martinus V apparently did not like this phrase, as – with some justification – he considered the deceased a usurper. However, the Florentines rejected his request to change the inscription, no doubt because of the close ties between Cossa and the powerful de’ Medicis. The tomb is completed by a gilt bronze effigy of the deceased on a funereal bed, an image of the Madonna and Child and a sculpted marble baldachin. A remarkable monument for a depraved individual. John Julius Norwich, The Popes. Annamaria Giusti, The Baptistery of San Giovanni in Florence, p. 56. Annamaria Giusti, The Baptistery of San Giovanni in Florence, p. 12.